The AAPT Summer Meeting, 2019 will be held in Provo Utah July 20 - 24. Join the AAPT at our 2019 Winter meeting in Houston, TX. The meeting is January 12 - 15 at the Houston Galleria. The summer AAPT meeting will be July 28 - August 1 in Washington DC. 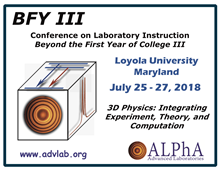 The next conference in the series on Laboratory Instruction in Physics beyond the first year will be at Loyola University in Maryland, July 25 - 27. This is an interactive guide to the August 21, 2017 solar eclipse, available as an app for both Android and iOS devices. Join the AAPT in Cincinnati, Ohio July 22 - 26 to explore the latest in physics education. Join the AAPT in Sacramento California for the Summer 16 meeting, July 16 - 20. Join the AAPT in New Orleans for the Winter 2016 National Meeting, January 9 through 12. Explore a collection of video-based interactive tutorials for introductory physics.